If your network systems are not functioning properly, your business comes to a halt. Florida Data Cabling specializes in helping businesses like yours take advantage of the latest in structured cabling systems. We do this by providing Cat3, Cat5e, and Cat6 data cabling services to Southwest Ranches businesses and businesses throughout South Florida. Our technicians are voice and data experts. We are committed to providing you network services that are secure, of high quality, and reliable. You want your business to succeed. We want your business to thrive. We feel that the structured cabling services we provide will help you do just that. They will give you an edge in a competitive South Florida market. We have seen the benefits that our network services provide to South Florida businesses. Over the years, we have worked on hundreds of projects in areas like West Palm Beach, Miami, and Fort Lauderdale. Even in these competitive centers of commerce, we have been able to help our clients get a competitive edge. As a result, we have a number of happy and satisfied clients. We have worked in Southwest Ranches on large projects and small projects. Our focus is creating and installing structured cabling solutions that are scalable. We want to meet and exceed your needs as our clients. Our track record more this speaks for itself. This is why so many businesses in South Florida turn to us for their network needs. We have installed Cat3, Cat5e, and Cat6 data cabling in IT companies, call centers, universities, and centers of manufacturing and industry. When we work with you, we offer a full service installation. This means that we will sit down with you and plan the job. We will design the job. We will provide you with the cables and terminations to complete the job. Our experienced and professional technicians will do the actual install. Then, we will review the work to make sure that it exceeds your expectations. When your structured cabling and network systems are not functioning properly, it can be a headache. Your business literally grinds to a halt. Customers are lost, revenue is lost, and time is wasted. If you are experiencing problems with your current structured cabling system, call us immediately. 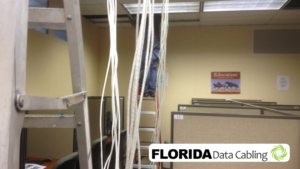 Florida Data Cabling is happy to quickly send out technicians who are skilled in identifying the source of these problems and providing workable solutions. Our goal is to help your business thrive. We invite you to join countless South Florida business owners who have trusted us with their voice and data networks. Our projects are delivered on time and on budget. We work with little or no interruption to your daily activities. Contact us today. We will schedule a free on-site estimate for you.